Give your soap a pretty place to stay in this delightfully rustic soap dish holder. Pretty and ornate in distressed cream finish with little scrolled heart design. The perfect little accessory for the kitchen or bathroom. Such a sweet little rustic design that will add a charming shabby chic look. 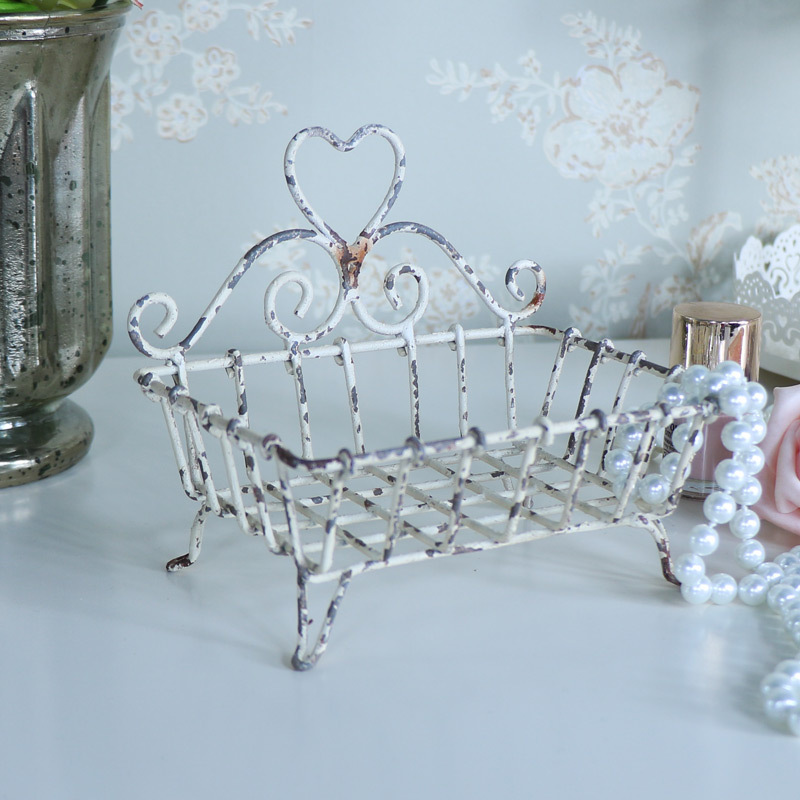 Little basket style holder with little metal feet and scrolled design with heart shape. This would look perfect sat on the sink side in the kitchen or bathroom. This little holder would also look fabulous sat on a dressing table used as a little holder for make up or toiletry bits. Give your soap a pretty place to stay in this delightfully rustic soap dish holder. Pretty and ornate in distressed cream finish with little scrolled heart design. The perfect little accessory for the kitchen or bathroom. Such a sweet little rustic design that will add a charming shabby chic look. 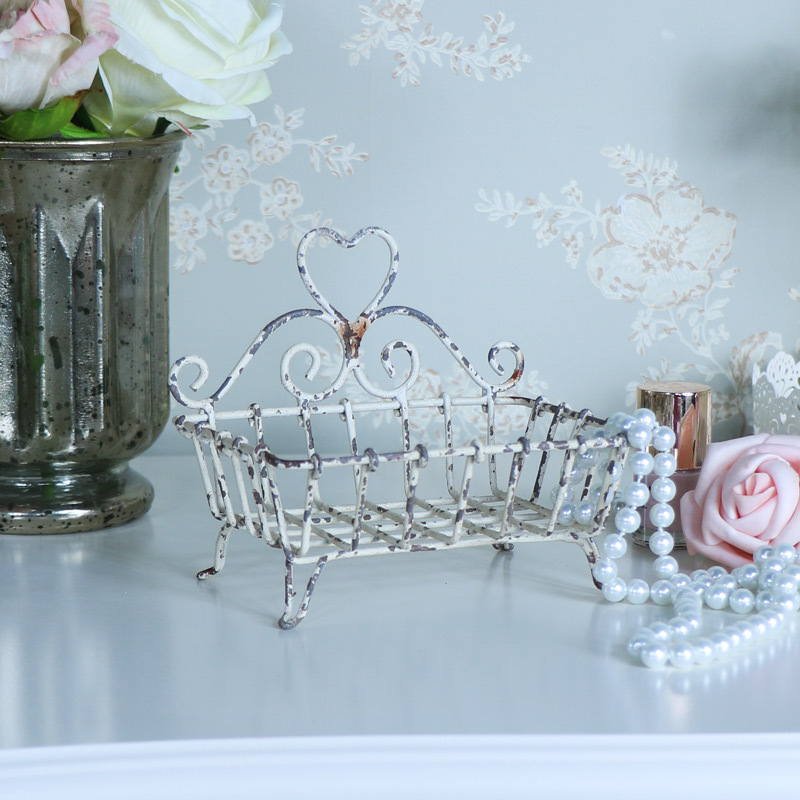 Little basket style holder with little metal feet and scrolled design with heart shape. This would look perfect sat on the sink side in the kitchen or bathroom. This little holder would also look fabulous sat on a dressing table used as a little holder for make up or toiletry bits. Made from metal in a cream distressed finish. We have a fantastic range of home accessories that help to make the house a home, so many little comforts that will add that unique personal touch.